Other than my end destination, the best part of this trip is that it gives you plenty of thinking time and, of course, I usually spend this time thinking of new foods I want to try out and different Twin Cities spots I need to visit. As you can imagine, I wind up getting a little bit hungry on the way! 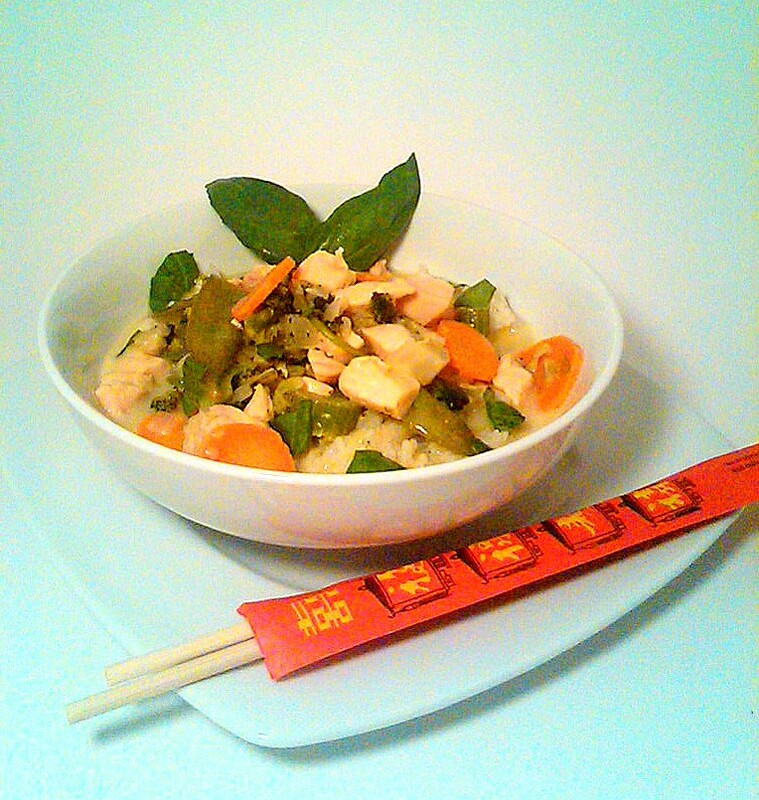 I was so lucky last time I visited – by the time I arrived at her house, Annie had made a saucy, delicious pot of one of my very favorite dishes – Green Curry. It was so fantastic, I stole her recipe and recreated it here at home for dinner last night – I think you’ll like it! One of the great things about a curry is that it works perfectly as a vegetarian or vegan dish if meat isn’t your thing – the curry paste is both vegan-approved and gluten free. I make Annie’s recipe with chicken, but you can leave out the protien for a dish that’s just as yummy and filling! For mine last night, I really copped out and just bought some fresh, pre-cut stir fry vegetables from the grocery. 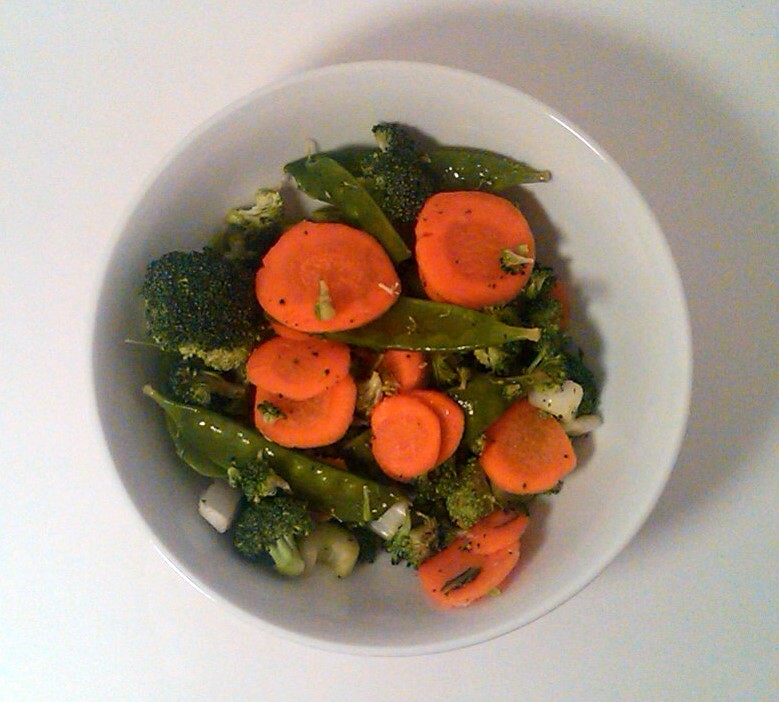 The bag had everything I needed – snow peas, carrots, some cabbage, broccoli – and cut down my preparation time at least in half, after a long day at work. Another awesome aspect of making curry is that it’s basically a one-pot meal. 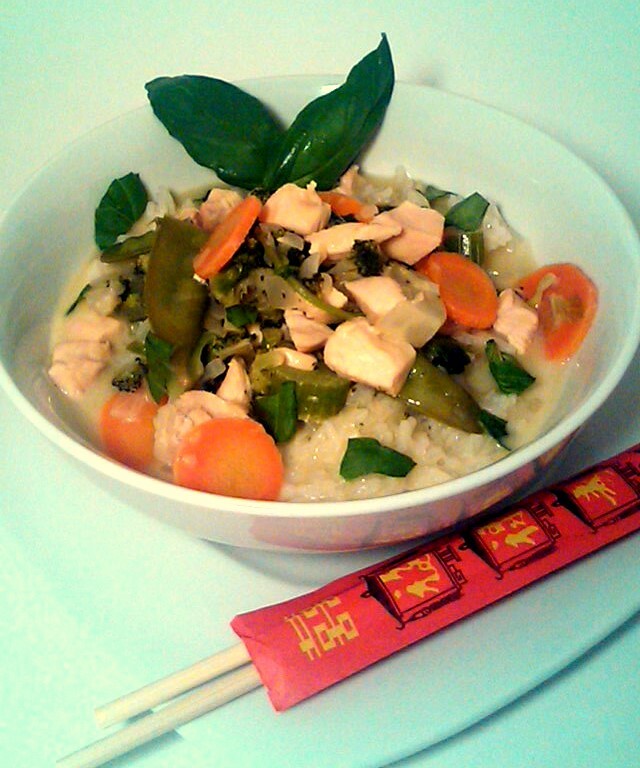 Other than cooking the rice in a different pot or rice cooker, everything else pretty much just gets cooked together. Less dishes to wash is never a bad thing! We held back just a little bit on the green curry sauce so that it wouldn’t get too spicy for The Redhead and she loved it! As I mentioned in the veggie fries post, she’s not too excited about eating veggetables, but she ate the chicken, sauce and rice with a smile and she at least gave a carrot or two a try. The fresh basil in the curry tastes amazing and the dish is so warm, flavorful and fragrant – one of my all-time standard favs (it also makes awesome leftovers!) This post is really making me want to take an adventure to some local Asian Markets in the cities…hmmmm….future post, perhaps?! 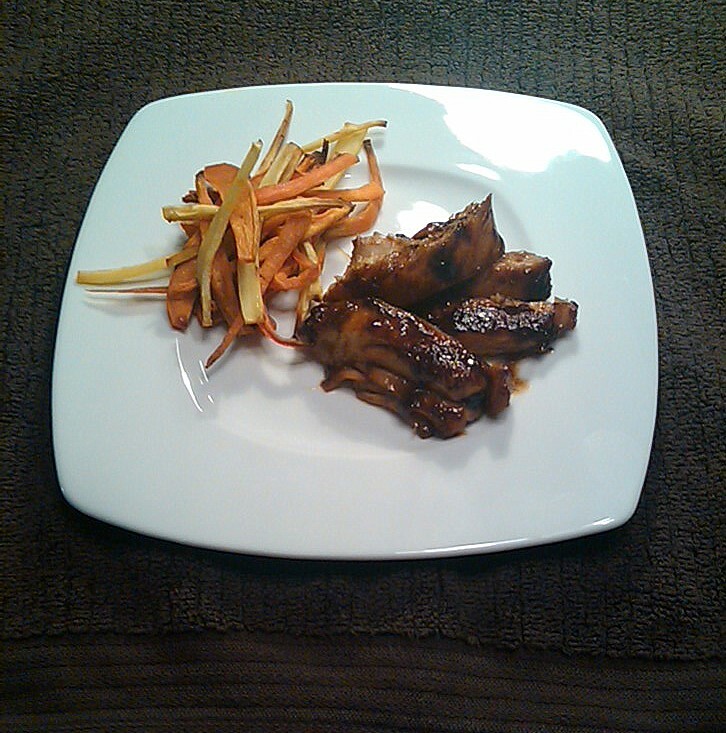 Give this dish a try and let me know what you think! For an added bonus, serve with wedges of lime – it’s great squeezed right in the curry! Have you ever had that experience where you planned something, looked forward to it, got excited about it and then when it came to fruition it completely fell short of your expectations? Not every story can be a success story and I figure if I’m going to write about the adventures of cooking, I’ve also got to write about my misadventures, and this happened to be one of them! The recipe sounded so tasty and the picture in the magazine was so appealing, I just had to try this Asian Bar-B-Que Chicken; however, the real deal wasn’t quite as impressive. It came down to the main ingredient: Oyster Sauce. Although a distinct and delicious flavor, the amount of oyster sauce in the glaze completely overwhelmed the roasted garlic and roasted, ground peppercorns (I fell in love with the flavor of the pepper, though – totally worth the effort! ), and it drowned out the flavor that I was looking forward to. One thing I’m slowly learning the more I cook, though, is how to balance and enhance tastes – it’s such an art and takes so much practice (and failure and practice again)! Remaking this dish, I added some honey to the ingredient list and it’s amazing how it transformed and rounded out and created a greater depth of flavor(the doctored up recipe is below). Give it a try the next time you fire up the grill! – Preheat oven to 350°. Wrap garlic cloves in foil and bake for about 30 minutes or until very soft. Squeeze garlic from the skins into a bowl and let cool. – In a skillet, cook peppercorns over medium-high heat until smoking and fragrant (about 5 minutes), shaking pan occasionally. – Transfer peppercorns to a spice grinder or food processor. Allow to cool and then grind to a coarse powder. – In the skillet, cook chopped onion in the olive oil over medium heat. Cover onions and stir occasionally until they have caramelized. – Add garlic, ground pepper, oyster sauce and honey and cook over medium heat for 1 minute, stirring constantly. – Add the soy sauce and cook until reduced by half (about 5 minutes). – Add the water and white wine vinegar and simmer over medium heat until the sauce is very thick (about 10 minutes). 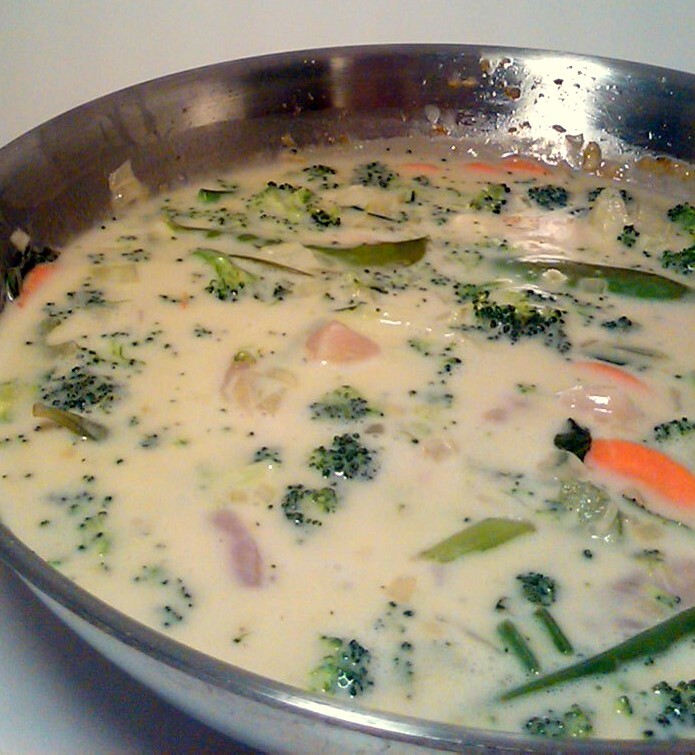 – Transfer sauce to a blender or food processor and puree until smooth. – Place chicken, skin side down, on grill or grill pan over medium high heat until skin is crispy (about 7 minutes). Turn the chicken and cook over medium heat until the chicken is almost cooked through (about 8 minutes). 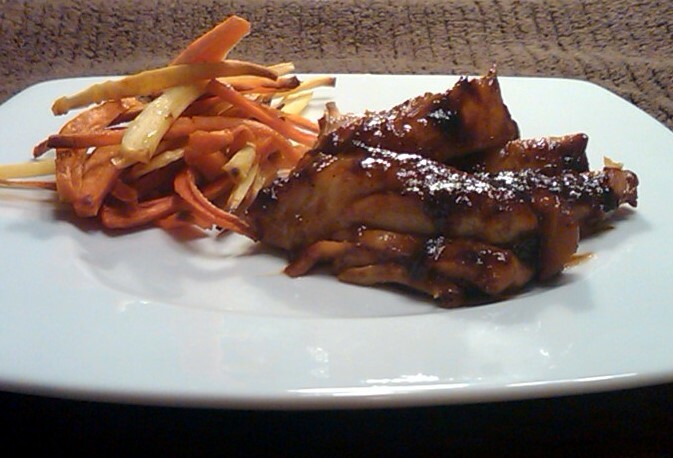 – Brush sauce onto skin side of chicken and grill until for about 30 seconds, until glazed. Turn chicken and repeat on the other side. – Repeat the glazing again on both sides. Transfer chicken to a surface to rest for 5 minutes. – Slice chicken and transfer to plates.